Hi, I'm new here. Pleased to meet you all. I'm a guy living in Tokyo, Japan. I'm really into music. My favorite PJ Harvey album is "Is This Desire?". Some of the other bands I like are Suzanne Vega, Underworld, The Sundays, Einsturzende Neubauten, The Verve, Kate Bush, David Bowie, Faye Wong, Killing Joke, Curve, Sisters Of Mercy, Blondie, Pink Floyd, Shiina Ringo, Joy Division, Cranes, The Smashing Pumpkins, Cocteau Twins, Placebo, This Mortal Coil, Talking Heads, Akino Arai, Bauhaus, Miki Furukawa, Gang Of Four, Perfume, Tangerine Dream, Lou Lesage, The Twilight Singers, Judy and Mary, The Stooges, Jesu, Death In Vegas etc. My name is Maciek, I live in Poland, Warsaw. To be honest, I read this forum since very long time. Thing that pushed me from anonymousness is growing anticipation for PJ's new album. My thing with her music began probably somewhere in 2005. 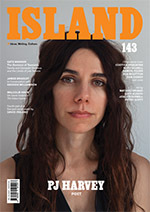 What I really enjoy in PJ Harvey's music and find very unique is her astonishing talent to make beautiful melodies - that her music, even arranged differently, with different tempo (and reworked in electro ) still would be beautiful. That thing, let's call it root of song, I find very rare in temporary music. 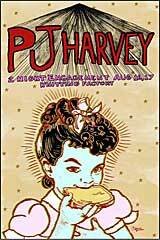 I participated in only one PJ's concert (but it was first and only gig in my country) - 2007, probably May in Warsaw. If you want to know my other musical interests, well, on second place (after PJ) i will put The Rolling Stones. I really enjoy two pop veterans - Madonna (ehh, except few last LPs) and Prince. But in general I listen to all this bands from Pitchfork like Radiohead, Grizzly Bear, Fleet Foxes, Grimes etc. What I search in music most of the time is this ephemeral-autumn-bittersweet sadness (like in Battleship Hill or most of White Chalk songs). Enough said that only really fullfill my musical needs. My name's Connor, I'm 18, and from the UK. Like Maciek, what made me sign up was the anticipation of the new album. I like a lot of music, too many artists to list, but PJ is one of them and that's the important thing. My favourite PJ album is definitely To Bring You My Love, and for my favourite song, I would say either the title track from that album, but it changes all the time. I was born in the desert. This place does not seem to be letting me post. For the love of PJ, please help! Sorry for the delay, the first few posts from a new member require approval by the admins. We've had spam floods before, and a few here and there still. I started to listen PJ's music just a few months (i think) after her first and only visit to my country (2004), so I've never saw her performing live yet. I hope that this new tour can bring her again. With this new "hope six" era she became one of my few all-time favourite music artists, specially because, unlike other artists, she searches for some important issues to write and sing about, and follows her own path. Besides all that i love to find "non official" bootlegs and stuff about PJ, so i think these kind of forums are a good source of it. Plus, sometimes i like to make some "artwork" for these kind of stuff, so maybe soon i'll be sharing some about the Nuits de fourviere concert . see you in between those topics! Hello, I thought it would be polite to post a greeting here before I say anything rude (or anything at all). I first heard Sheela-na-gig back in 1992 and that was it. Lots of artistes and musical styles appeal to me, but nothing speaks to me as deeply as PJ's work, and gradually she's eclipsed everyone else I've taken an interest in. I was born in Dorset, though I no longer live there, and her words seem woven through the landscape whenever I find myself there - as I did this week, visiting the chapel at Abbotsbury. It's full of nesting pigeons at the moment and smells dreadful. I've already found my way to some very helpful places via this forum, before signing up - so thank you, all of you, for maintaining it. Welcome James! I discovered Polly in 2004 due to her Beefheart connections (she was already being described as a "living legend" then). Been a fan ever since. PJ Harvey's music is awesome. She is a true artist.